Queen Victoria presided over a five-continent empire. That's nothing compared to the influence Janet Yellen will have if she's confirmed as Fed chair. She's been called a "small lady with a large I.Q.," but future Fed Chair Janet Yellen should be called something else now: the most powerful woman in history. Okay, I know that sounds a little hyperbolic. A lot hyperbolic actually. How is the ability to set interest rates more powerful than Queen Elizabeth and Victoria's five-continent empires, or Catherine II's efforts to bring the Enlightenment to Russia? Well, the answer is one part context, and another part depressing. The context is that the Fed Chair is maybe the third-most important job in the world right now, and being powerful in a globalized world matters more than in a non-globalized one. Queens could only dream that their edicts moved the world economy as much as a dramatic FOMC announcement does today. The depressing bit is that there just haven't been too many powerful women before her. The list of female heads of state or Fortune 500 CEOs or central bankers is still far too short -- particularly that last one. So it's not too much to say that Yellen, our first female Fed Chair and certainly the most qualified nominee ever, will have more influence over the world than any other woman before her. Let's think about why. The Fed is as powerful as it is boring. (Alright, maybe not that powerful, but you get the point). See, its job is to make sure the U.S. economy stays in the Goldilocks zone: growing neither too fast nor too slow, but just right to keep both unemployment and inflation low. It raises interest rates when it thinks growth is too high, and cuts them when it thinks growth is too low -- and it does all this by controlling how much money is in the economy. 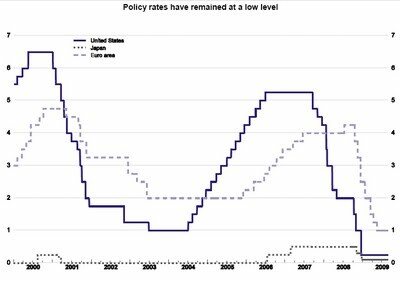 But the Fed's interest rate decisions don't just set the course for the U.S. economy; its decisions set the course for the world economy too. That's because the dollar is the world's reserve currency, and so many emerging markets have pegged their own to it -- which means they've decided to import our monetary policy. Think about it this way. If I say my currency will always be worth a certain number of dollars, then I have to print more of it when the Fed prints more dollars. That's why economists call the Fed a monetary superpower: it's the world's central bank all but in name. And, as you can see in the chart below from economist David Beckworth, the Fed's hegemony isn't limited to emerging markets. The European Central Bank (light blue line) and the Bank of Japan (black dotted line) have also followed the Fed's lead the past 10 years or so. In other words, Janet Yellen will have more control over the global economy than any other living person once she's confirmed as Fed Chair. Now, the Fed is a democracy, not a dictatorship, but it's a funny kind of democracy -- the Chair alone sets the agenda. So if Yellen even just talks about slowing down the Fed's bond-buying, Europe's troubled economies are liable to see their interest rates rise, and emerging markets are liable to see their currencies collapse. Yellen doesn't rule an empire the sun never sets on, but she has one big trump card over the queens of yesteryear: she's alive today. Yellen's decisions will affect everyone around the world. The same can't have been said of, say, Cleopatra or even China's only female emperor Wu Zetian (and yes, she took the title of "emperor," not "empress"). For all their power, it was limited to the lands they ruled. Yellen's real competition for most powerful woman in history doesn't come from female heads of state of the distant past, but rather of modern times. Women like Indira Gandhi, Margaret Thatcher, Dilma Rousseff, and, of course, Angela Merkel. But for all their influence -- and in Thatcher's case, she's cast a long ideological shadow -- Yellen has another advantage. She's a powerful American at a time when America is still the most powerful nation. Now, you can make a strong case that Europe's slow march towards federalism -- or financial ruin! -- has made Merkel more significant. But Merkel only holds the economic fate of Europe in her hands. Yellen will hold the economic fate of, well, the whole world in hers. And she'll hold even more of it than a Fed Chair otherwise would, because Tea Party Republicans have paralyzed Washington so much that the Fed is the only game in town. 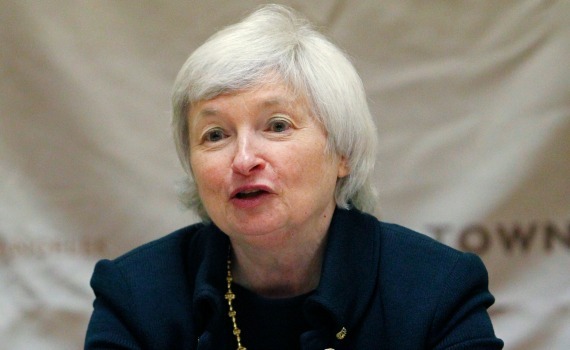 Of course, Yellen might only hold on to her title of most powerful woman ever until 2016. Not that she'd care about losing it.